Did you know that Facebook already allows us to use Hypertext Transfer Protocol Secure (HTTP Secure)? It's an encrypted form of information transfer on the internet, so our Facebook sessions are more secured. In addition to that, they also allow us to download everything - as in EVERYTHING - our profile contains. I am not sure when did this feature start, but I'm glad they have this option now. It may come in handy if our data (e.g. pictures, videos) are only available in Facebook and we want to have a backup of those for whatever purpose it may serve us. This file, in essence, contains sensitive information about us. Remember that we should keep it secure and take precautions when storing, sending or uploading it to any other services. 1. To begin, go to your Account Settings page, then click the "learn more" link beside "Download Your Information." From there, click the "Download" button. 2. The screen below will be shown. It will be asking you to input something, then you need to wait for an email. 4. When you click the link, it will show you the page such as below, where you need to enter your password for final verification. 5. 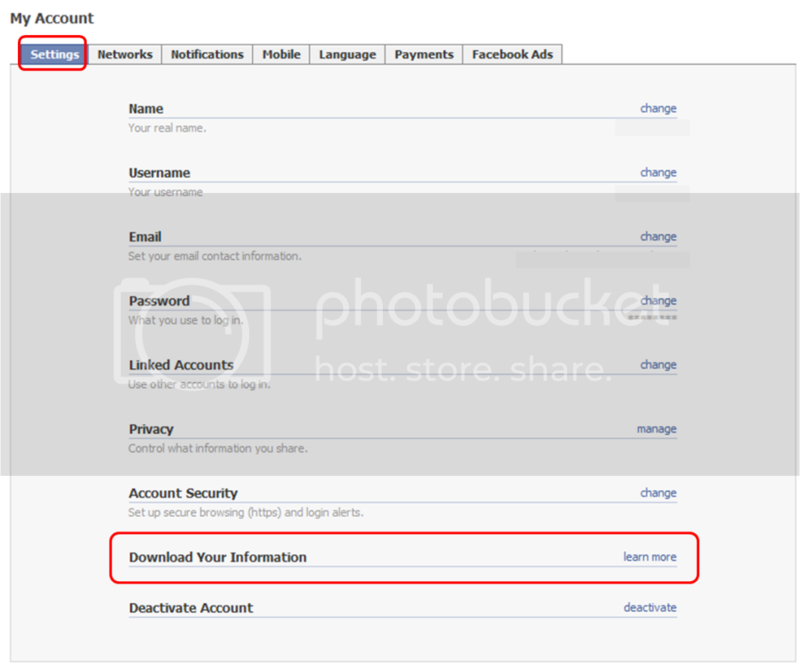 Finally, you need to click on Download to finally start downloading all your Facebook contents to your computer, which comes in *.zip file. Mine reached around 299MB, but it would really depend on how many pictures, videos, and posts you have on your profile. There - I have just secured a copy of my Facebook data in case anything goes wrong. I'm curious, though, how often will Facebook refresh the contents, so I can download a new file again with the updated data. You see, when you exit and come back to repeat Step 1, it will already lead you to Steps 4 and 5. This means you will be downloading the same content as before. Anybody have an idea? Another thing Facebook can improve on is to give an option to users on what data they only want to download (e.g. only friend list, only photos and videos, etc.). In this way, users will have the flexibility to choose what they want. hmmm this is good but you're right, what if you want to update your downloaded data... maybe in the future meron nang sync option. nice post! i will follow the steps.. tnx for sharing. I downloaded the data but it completely left out my entire wall contents and it wont refresh so I can retry.